Over a year and a half ago, I started a column for InkedMag.com, called Inked for A Cause -- it combined two of my passions: socially-minded people and my 20-year love affair with body art. Like most tattooed people, my tattoos have a deep personal meaning to me. But about four years ago, I noticed a transition -- my tattoos became more defiant. The Tibetan flag is outlawed in Tibet. The phrase Bho Rangzen, 'Free Tibet,' is also punishable. Crackdowns on artists and writers continue at an alarming rate inside Tibet, and I find it necessary to make marks of protest in any way I can. In that vein, I began recently to pursue another love of mine -- cultural anthropology. I realized that there are many books on tattoos, everything from flash guides, to beautiful books of Japanese masters, to the prison tattoos of the Russian mafia. Tattoos have transcended the alternative, and become mainstream. People are becoming more aware of tattoos' relevance in different cultures -- from passage into manhood, to the blessing tattoos given by Thai monks. I wanted to explore this within the Tibetan exile community -- and particularly those of ex-political prisoners. 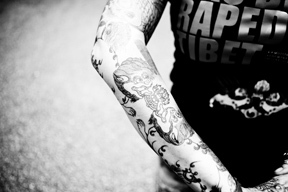 I had previously interviewed a Tibetan tattoo artist in-exile -- he will tattoo 'Free Tibet' for free. This past week I completed my first interview with a member of GuChuSum, the ex-political prisoner's association in Dharamsala, India. I'm hoping that presenting human rights violations in a different slant will encourage young people to learn more, and use their voices to effect change. I'd be curious to see pictures of other socially-related tattoos and their meanings in the comments section!